Mermaid – Beauty with Beastie Habits – Is it Real? Imagine you are sitting at a secluded portion of the seaside, enjoying the calm and serene environment. Suddenly, you feel that there is some movement in the waves and then emerges a stunningly beautiful mermaid. You are feeling mesmerized by her beauty, those long, blonde hair, bluish-green eyes and shimmery, turquoise blue lower body. She asks you to come with her to a dreamy and heavenly land. You feel like giving in to that beauty’s demand. But, if you want to live then run for your life because mermaids simply cannot be trusted. Why? Read on to learn all about the legend, myths, and facts about mermaids. In simple words, mermaids are aquatic creatures; the females are called mermaids and males are called mermen. But, there is a huge difference between other marine life and mermaids, which is that mermaids are half human and half fish. Their face and the upper half are that of a female (probably the most gorgeous female you have ever seen) and the lower half is covered with fish-like scales and a tail. If you don’t find this creepy enough to stay away from mermaids then there is more to their story, which will be shared ahead. Since the dawn of civilization, people have tried to inhabit almost every part of the world. Back in the ancient times, people preferred to settle down nearby rivers and seas to prevent water shortage (as there weren’t any water hydrants at that time). They believed that the rivers and seas were supervised by sea gods. These gods were believed to be a combination of men and fish. The very first account of a sea god appeared in Babylonian scriptures, about 7,000 years ago. Terry Breverton wrote in his book Phantasmagoria: A Compendium of Monsters, Myths, and Legends, about a merman Ea in the Babylonian era. People believed in the god Ea and considered it to be the bringer of wisdom and knowledge. Ea was later named by the Greeks as Poseidon or Oannes while Romans adopted him as Neptune. Another popular merman story is about Triton, the son of Poseidon and Amphitrite. He seems to be quite an interesting creature as it is claimed that he could easily blow the conch shell while gliding over the sea waves. With the passage of time, ancient civilizations changed their preference for sea gods from strictly male to female. The clearest historical indication of mermaid comes from Assyria, which in modern times is known as northern Iraq. The era is 1,000 BC. That’s the time when mermaids are said to have appeared as sea gods. The first ever known case of a mermaid sea god was Assyrian goddess Astargatis. According to historical accounts, Astargatis was goddess Atargatis’s child. She fell in love with a human shepherd but later ended up killing him, unintentionally though (wow). She started having guilty pangs and decided to punish herself by hiding in the sea as a fish, away from the world. Of course, there has to be some drama here. So what happened was that the sea refused to transform her fully into a fish claiming that she was too beautiful to become a fish. The sea decided to keep the upper half of her body as it was, and transformed lower half of her body into a fish. That’s how the world’s first ever mermaid was created. A similar story about the creation of mermaids is told by Greeks. The only difference is that their goddess’s name is Aphrodite. Interestingly, it is said that in Greece, Alexander the Great’s sister became a mermaid after her death and she is still alive and swimming in the Aegean Sea. Rumor has it that once she appeared and asked the crewmen of a ship sailing on the Aegean Sea about Alexander. She asked if he was alive and they said that he was alive and busy in conquering the world. She was so happy that she made the stormy sea calm so that sailors could navigate easily. In modern times, it is Hans Christian Andersen’s fairytale “The Little Mermaid,” published in 1836, which made mermaid a household name. It is this story that stirred the media about mermaids and we became so familiar and mesmerized by this unlikely sea creature. Mermaids have remained part of every culture’s folklore since a long time. 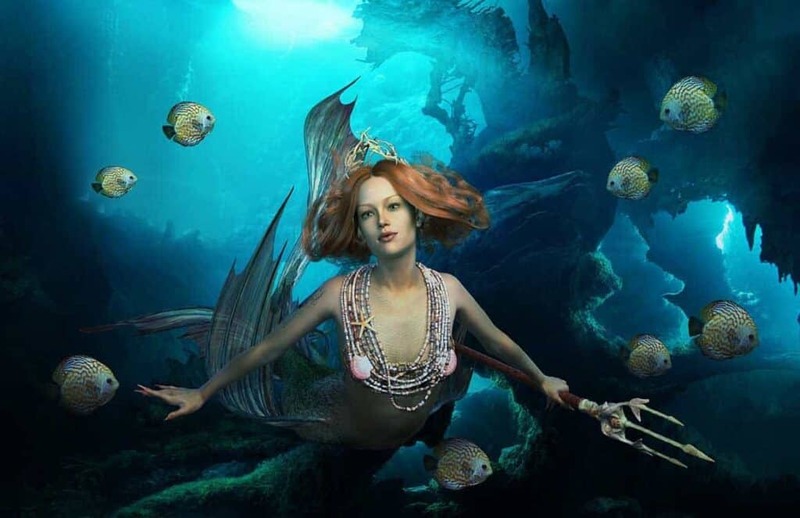 From ancient times, civilizations have remained in awe of mermaids and have offered different versions about the origin and characteristics of mermaids. Some believe mermaids are loving and kind while some claim them to be pure evil and enemy of humans. So, let’s check out how mermaids have been represented across cultures. For Japanese, the mermaid is more of a monster than a beautiful creature. Japanese folklore describes mermaids as a giant fish that features the face of a human and a monkey’s mouth. It is also believed that mermaids may have horns and teeth. Legend has it that whoever eats a mermaid, which is called Ningyo in Japan, will get eternal youth and beauty. But, catching a mermaid is said to be bad luck as it brings misfortune and harm to the whole village. In Scotland, mermaids are referred to as Selkies. These are said to be gentle creatures which live as seals when in the water and transform into a human when on land by shedding their skin. Selkies are associated with mermaids because, in Gaelic folklore, they are referred to as maighdeann-mhara, which means “maid of the sea.” In Scottish folktales, mermaids often meet a tragic end such as in one story selkie’s sealskin gets stolen to find which it marries a human and has children. Later when the lost sealskin was found, she was called back to the sea. In African folklore, there is a story about Mami Wata, the water spirit. Its description is quite similar to a mermaid. Mami Wata is claimed to be a snake charmer and may take human form when needed. However, she cannot transform into a full human. She is linked with fertility and healing. The Lady of the Waters, Iara, is Brazil’s version of mermaid legend. She was originally called the water snake but was later immortalized as a mermaid. She is said to have brown skin and green eyes. Iara is believed to have an evil streak as she lures men (mostly sailors) to her underwater palace. Those who went with her never came back. Iara has been blamed to be the cause of various accidents and disappearances across the Amazon. Unsurprisingly, almost 90% of these disappearances are of male sailors. That’s why we warned you to never follow a mermaid no matter how gorgeous she appears to be. According to folklore, the taniwha or guardian of the sea Marakihau is a mermaid. Her accounts haven’t only been told through stories but she also is featured on various carvings of the time. Marakihau is said to have a human head and long body that resembles a fish. She is also believed to have a very long, tubular tongue with which she swallows fishes in large amounts and also destroys canoes. In many medieval era European folktales, there has been mentioning of sea fairy Melusine. It sometimes has wings but usually is described to have a serpentine tail. Tales about Melusine vary greatly in French and German cultures. Generally, the legend is that Melusine was a determined maiden who took revenge from her father for her mother. Ironically, her mother punished her with a serpent’s tail. The royal French house of Lusignan is regarded her descendants of Melusine. You must already be familiar with her as she is the central figure in the brand logo of Starbucks. In Ireland, there are stories about female merrows, which are half-human fishes having long, green colored hair. As per Irish folklore, a magical cap known as Cohuleen Druith forced merrows to live underwater. Male merrows are described as hideous and very scary. Legend has it that merrows start living on the land with humans and even start families but when they get bored, they return to the sea. Leaving their families behind of course! There is a Slavic myth in Russia where mermaids are referred to as Nymphs. These nymphs are believed to be very kind and compassionate. Nymphs usually emerge from the waters in the spring season for watering crops. There is, however, a frightening aspect to the Russian folklore about mermaids. According to the legend, Rusalka mermaids are actually spirits of girls who were violently murdered. Rusalka is believed to be hunting for males. They lure men and children using their long hair to trap and tangle them. Once trapped, they kill them by drowning them into deep waters. Rusalka has translucent skin and look exactly like a ghost. Sea shape-shifters also are topic of various folktales in Norway. There is a story about finfolks, which are nomads and can choose to live on land or sea. Their ancestral home is called Finfolkaheem. Finfolks are quite evil creatures that kidnap humans to marry and make them their servants instead of a partner. People also believe that Finfolks are scared of silver so if you meet one someday you must throw a silver coin in their way to make them run away. In popular culture, mermaids have remained the central part of many legends. In folklore, these half-human and half-fish creatures have been an object of curiosity and interest since the Middle Ages. 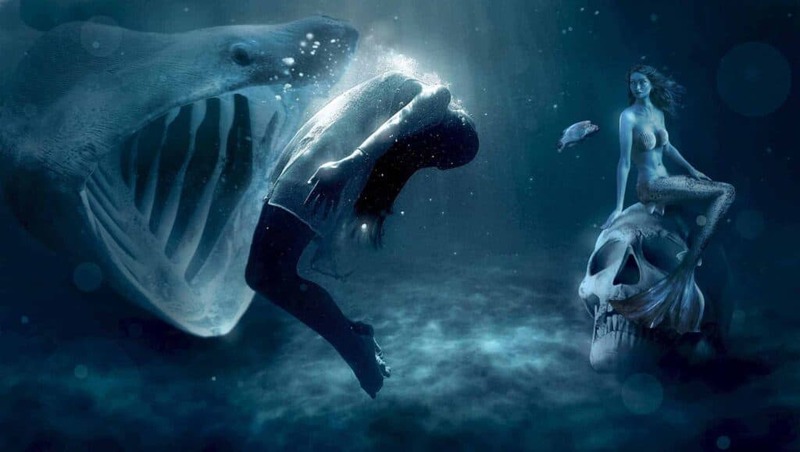 Naturally, there are many scary myths and stories associated with mermaids. Let’s dig deeper and check them out. In European mythology, there are stories about beautiful and seductive mermaids with evil intentions. According to mythological accounts, mermaids are as beautiful as the goddess Atargatis, and sailors get instantly attracted to them. After trapping the poor sailors, they drag them into deep waters and eat them. Remember those frighteningly evil mermaids from the Pirates of the Caribbean: On Stranger Tides (2011). Mermaids are usually linked with misfortune and death. In the 16th century, a writer and cartographer Olaus Magnus wrote about sea monsters observed around Scandinavia. According to the stories written by Magnus, fishermen claim that if someone encounters a mermaid or merman and doesn’t let him/her go then the person will meet a tragic end. The mermaid/merman will call all other monsters and they collectively attack the human. Also called the seal-people, these beastie mermaids are considered to bring bad luck to the one who sees them. It is indeed bad luck when one gets attacked by multiple sea monsters… right! 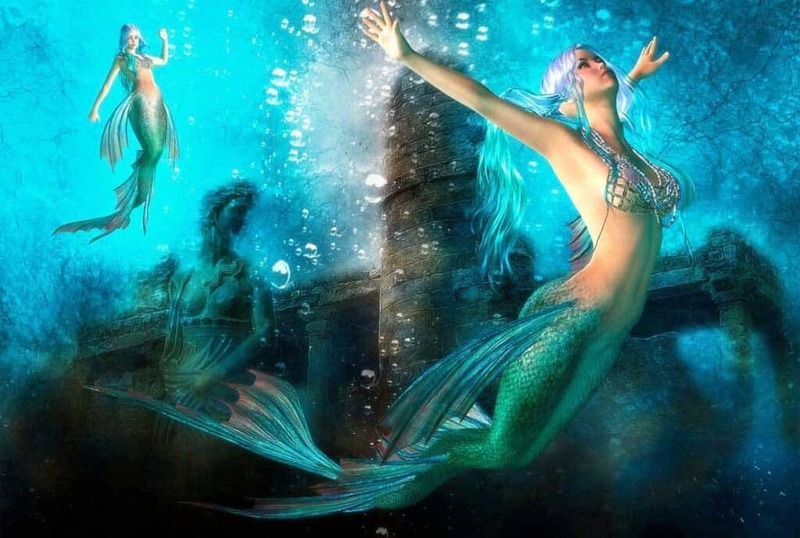 Mermaids… are they Counterparts of Humans? It is an ancient belief that whoever lives on the land has a counterpart in the sea and humans are no exception to this. It was believed that just like there are sea cows and seahorses, so mermaids are counterparts to humans. One such creature was captured by French naturalist Guillaume Rondelet in the mid-16th century. Rondelet claimed that the creature he caught resembled monks and bishops. There is also mentioning of the bishop fish or sea monk in the year 1817 Encyclopedia of Metropolitana. This creature resembled a monk but the lower part of the body was that of a fish. It also had a natural garb just like monks on land have. The creature was taken to the King of Poland, who ordered for it to be sent back to the ocean. Mermen are seriously underrated as monsters when it comes to discussing the evil side of mermaids. Mermen are perhaps equally or even more dangerous as mermaids. They have a history of sinking ships by creating storms in the oceans. Also, they have been blamed for causing deaths of a large number of sailors over the course of centuries. The Blue Men of the Minch is the most notorious of all mermen clans. They live in the Outer Hebrides, nearby the coast of Scotland. Appearance wise, they resemble humans but only up to their abdomens. From down below, their body has blue and gray colored beard. According to myths, before attacking a ship, the Blue Men challenge the ship’s captain to participate in a rhyming contest with them. If the captain is witty and agile enough to beat the Blue Men at the game, they are spared from being drowned into the deepest pit of the ocean. If not, you can easily imagine the penalty. Although there hasn’t ever been a definitive and conclusive research about mermaids but there have been sightings of mermaids across the world. There is historical evidence of mermaids available. So, rejecting the very idea of mermaids living in the sea is quite illogical. In Roman Emperor Augustus’ era, about 63 BCE to 14 CE, a number of artists created images of a mermaid. These images were drawn from life. Jenny Hanivers, tiny mermaid-like creatures, were quite popular among sailors during the 1500s. They often bought them from Antwerp on their way back home. And who can overlook the statement from the legendary Christopher Columbus who claimed to have seen three mermaids off the Haiti coastline in the year1493. Columbus was a bit disappointed though as the mermaids he saw weren’t as stunningly beautiful as he had heard about them to be. Maybe the beauty part is a little bit exaggerated. In his book Natural History, Roman naturalist Pliny the Elder wrote about mermaids like creatures whom he named nereids. However, unlike popular imagery of mermaids, Pliny claimed that the mermaids had scales even on the human part of their body. But, he never saw nereids himself only believed a few sources. In 1614, Captain John Smith saw a mermaid and instantly fell in love with her. Capt. Smith is famous for establishing Jamestown and his association with Pocahontas. His encounter with the mermaid is narrated in the Incredible Mysteries and Legends of the Sea by Edward Snow. It is written in the book that Capt. Smith saw a beautiful female off the coast of Newfoundland. He was mesmerized by her long green hair, finely shaped nose, big eyes and balanced ears. But, when he looked closely, he was disappointed to see that half of her body was like a fish. At the coast of Wales, near Pendine people sighted a mermaid. The first spotter was a farmer called Thomas Raynold who then called others to see the mermaid. Reportedly, the mermaid remained there for three hours. Then William Saunders created an image to depict the incident while witnesses described the mermaid as a giant fish that had a human-like upper body. During the 18th century, Europeans encountered many mermaids while they were cruising across the Indian Ocean and the South Pacific. The Dutch East India employees regularly saw them on their voyages. Painter Samuel Fallours created a drawing in 1718 that showed a mermaid, which he claims to have caught himself and taken to his home to draw the picture. But after four days the mermaid died due to starvation because she refused to eat anything. Despite these sightings, the National Oceanic and Atmospheric Administration (NOAA) states that there isn’t any clear evidence of aquatic humanoids like mermaids. The reason why sailors report about seeing mermaids is that after weeks and months-long voyages at the sea, they usually get bored and create such images in their mind where seductive beauties lure them towards the shore. Moreover, what Christopher Columbus saw weren’t mermaids but manatees, which can emerge from the seas especially from shallow waters. Manatees have fingerlike bones, forelimbs, and a neck too. Perhaps, that’s why Columbus didn’t like their appearance as Manatees aren’t supposed to be beautiful. There is another aquatic creature that can be confused for being a mermaid, claim scientists. This creature is found in the Pacific Ocean and has been named Dugong, which is a Malay language term that means “lady of the sea.” The Dugong is exactly like manatees in appearance. And about Jenny Hanivers, scientists give the explanation that these were actually skates and rays. The carcasses of cartilaginous fishes were dried, carved and polished by sailors to give them the look of mermaids, devil fish or even demons. Jenny Hanivers is discredited by science for being a hoax. How can we overlook the fact that ocean covers about 71% of the Earth’s surface and as admitted by the NOAA itself, about 95% of the oceans haven’t been explored as yet? This means there might be creatures like mermaids hiding beneath the seas only to emerge occasionally to claim a victim or two and satisfy their hunger. After all, there are many accounts of real-life sightings of mermaids to ignore. Almost every culture has a story about a mermaid, which is yet another proof that people must have seen them. So, the next time you are sailing, be alert as you may not know when a mermaid emerges from the water and lures you towards her. You have been warned! Previous articleSome Indians are Swallowing Live Fish to Cure Asthma – Does It Make Sense? Next articleChupacabra: A Mysterious Beast, Vampire or Just an Urban Legend?